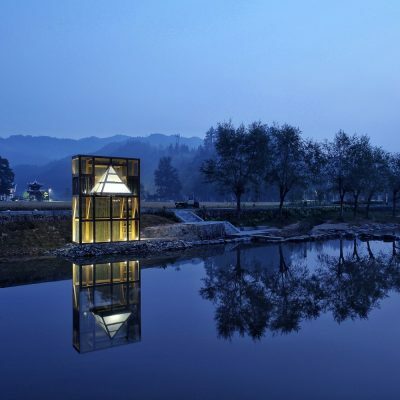 The mirrored sight shelter tells the story of the Longli people — a vernacular community that has experienced isolation and tension in southeast Guizhou, China. 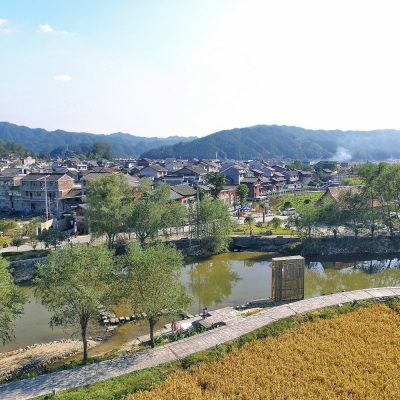 Yu Qiuyu, the famous writer, once remarked Longli as a lonely islet of the Han culture amidst the minority groups. For the tourists, the islet might be merely a cultural symbol, whereas to the local residents, this islet symbolizes their situation in all forms of survival predicaments. So the architects designed this shelter for Longli to reflect on a critical period. 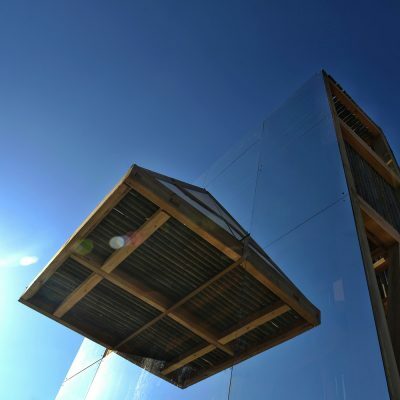 Right opposite to the old town by the river, The Mirrored Sight shelter reflects the town’s image. Longli sits within the town whereas the shelter lies outside. There are thousands of residents in Longli and the shelter is just for one person to reside. The town is for daily life and the shelter creates unusual experience for people – in the town of Longli, they belong to a big group, however here in the shelter individual is better appreciated. The effectiveness of our project is further proved by the energetic interaction between the project and the users after it was completed. In designing the Shelter, the architects articulated the isolation and tension of the Longli people and the vernacular community. They then created this Mirrored Sight of Longli. The shelter itself is now a place for people to rest and have fun, and meanwhile a new regional landmark. The shelter is connected to the old town by a stone bridge and the locals would go across it everyday to farm, to fish, to do laundry and to wish dishes. 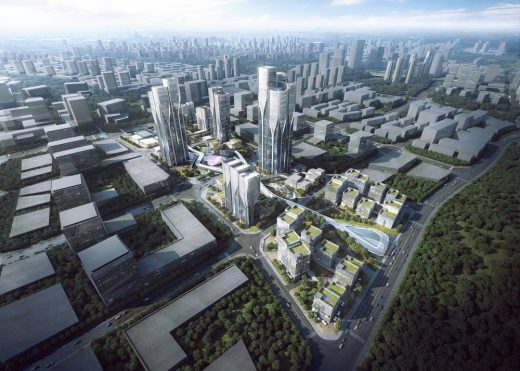 The site itself is a space transition from the man-made old town to the natural landscape. There are two floors in the shelter – the upper floor for people to overlook the scene and the lower floor for one to stay and rest. The axes formed by the old town and the river defines the relationship between the shelter and the site. The architects used completely different materials to construct and differentiate the northern and southern facades. The shelter’s west window frames a view of the Longxi Bridge, a bridge that was built in Ming dynasty and forms a shape of bow and arrow together with two roads by the river. The east window captures the view of the Scholar Bridge, which is a memorial to the ancient local scholar Wang Changling. The three apertures of the Scholar Bridge forms the shape of a fish creel and the scenes captured in the two windows are both import local Feng Shui (traditional Chines geomancy) imageries. The pyramid-shaped inner space would give the wrong impression that the space is rather narrow. However, when going upstairs, visitors would find it in fact much bigger than they thought. The project objective was to create a lonely islet that would bring people back to the early Longli, which was forgotten and abandoned. To properly designed this project, the first thing to do was to create a surprise effect when taking the visitor to gradually discover the space. The first floor is an exploration in creating a more layered and sequential experience. The second floor is a ritual space, serene and tranquil, marking the transition between the public and private. The visitors saw complicated reflection in the glass, was immersed in a shadow of the reality. The project started in October 2016 in Longli, a small town in south China. Construction was completed in just one week, cost only 7500 dollars. 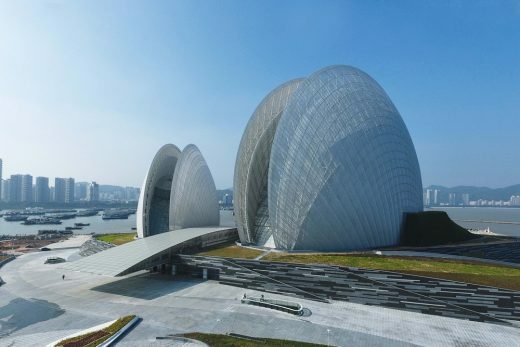 Architects used completely different materials to construct and differentiate the northern and southern facades. 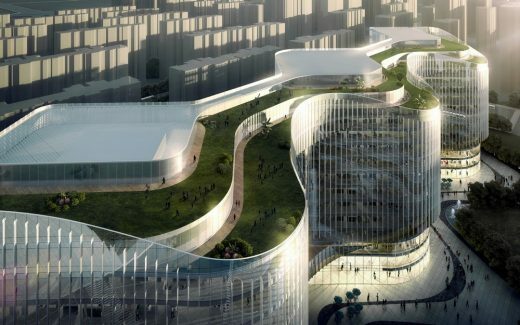 The northern façade, densely covered by local bamboo wood, parallels with the axis of Longli town, and the southern façade, cladded with Pilkington Mirropane (single-transparent glass), parallels the Longxi River. Therefore, the installation comes into a simple shape narrowing eastward. The entrance of installation faces to the old stone bridge, making a relationship between the ‘Opposite Shelter’ and old town. The glass reflects scene of Longli’s daily life south to the river, and creates a shadow of the reality. The mirror image of the pyramid becomes a shadow of the pyramid itself. The refraction and reflection of the glass would give people who gets inside the installation an experience of an integration of a complex mirrored sights, which one can hardly which is real and which is unreal. The Shelter itself is not completely lying out of the Longli town, rather it is an installation built upon the inter-related images of the town of Longli. But after dark, the shelter shows an utterly different presence as that of daytime – a lonely islet. Single-transparent glass became a powerful tool for us as they relied only on the natural light and existing s scenery of the site. This project is in a shifting process to renew its image and improve its function. 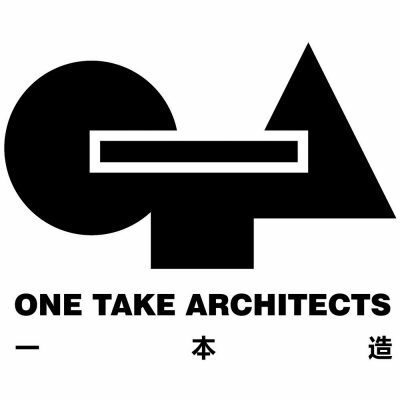 The architects researched a lot of local architectures and traditional culture to develop the projects’ language, they embraced transitional culture without directly replication. The main challenge was to blend effortlessly modern design and traditional construction. 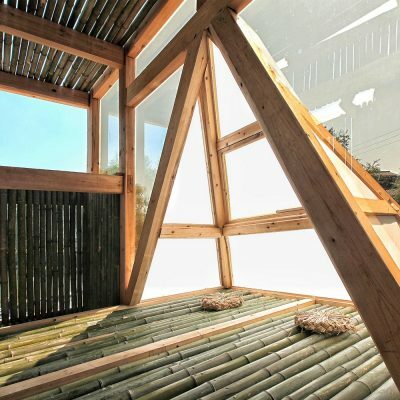 Limited by time and budget, the whole project concept is based on using locally available materails, such as wood, bamboo. It’s completed in only one week, cost 7500 dollars. In Longli, most of workers are not professional, they come back home to harvest their fields during the busiest seasons, and become construction workers in the slack seasons. They are different form workers in the city. It’s very hard for them to understand what’s your purpose, they prefer to work in the traditional way. 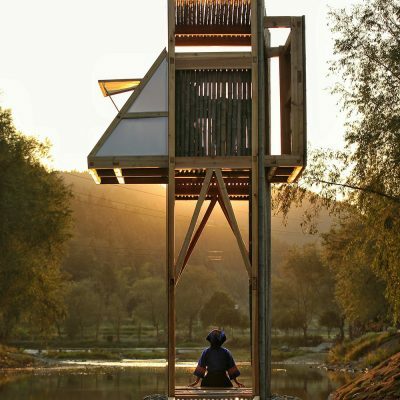 A’ Award and Competitions are pleased to announce that the work mirrored sight shelter by Li Hao and Nan Xueqian became winner of the prestigious Golden A’ Design Award at Architecture, Building and Structure Design Competition highlighted as one of the winners by the transnational jury members of the A’ Design Awards & Competitions among thousands of projects. 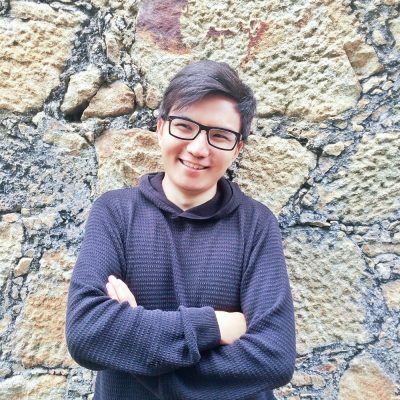 Li Hao, the project leader of the awarded design mirrored sight shelter explains “In designing the Shelter, the architects articulated the isolation and tension of the Longli people and the vernacular community. They then created this Mirrored Sight of Longli. The shelter itself is now a place for people to rest and have fun, and meanwhile a new regional landmark. The pyramid shaped inner space would give the wrong impression that the space is rather narrow. However, when going upstairs, visitors would find it in fact much bigger than they thought.